​The FLIR E75 is a truly professional grade thermal imaging camera that FLIR produces along with many others. The E75 has more powerful variants the E85, and E95 (the biggest difference is higher thermal resolution) however the E75 is a great choice when you need a professional grade thermal imaging camera ​but​ want the most bang for your buck. ​The 320x240 thermal resolution camera gives the user more than 76,000 temperature measurement points and along with FLIR's MSX technology which overlays visual images on the thermal images producing crystal clear pictures allowing you to easily identify potential issues. The IPS touch screen allows for quick and easy navigation through the options menus. The 30Hz refresh rate also keeps image blurring to a minimum when moving the camera from target to target. The large temperature detection range of -4F to 1830F ensures that you will be able to diagnose the vast majority of issues. ​The built in microphone allows you to easily annotate reports ensuring you don't miss important details. FLIR has also included their easy to use report generation tools which allows you to quickly and easily. The E75 also includes a laser distance finder which speeds up the auto focusing and reduces the time needed to capture images. The E75 is also built to be used every day and can withstand a two meter drop onto concrete. One of the biggest advantages of the E75 (and the rest of the E series) is the fact that the lenses are interchangeable allowing you to swap out as needed for different projects. ​The E75 also comes with a variety of lens option choices from standard to telephoto to a combined standard and telephoto option although at a higher cost. ​The E75 also offers Meterlink connectivity so that you can connect FLIR multimeters, moisture detectors and other FLIR measurement instruments. ​The E75 is more costly than other thermal cameras because it is intengted for professionals or very particular home owners who want a feature filled high quality thermal camera. 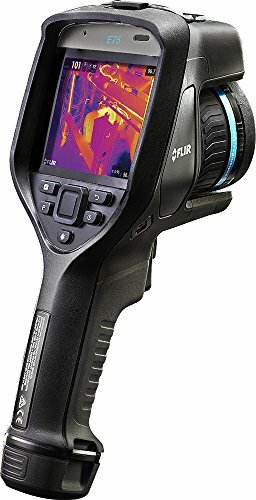 That being said if you have the money this is one of the best thermal cameras you can buy and is a good investment.